I've had several days now with the new Dark Eldar / Drukhari codex, and all I can say is WOW! Just wow! On a scale from 1 to 10, this book is an 11. Seriously. I don't even know where to begin... at this stage it feels like this book offers limitless possibilities to Dark Eldar players, and that is probably my favorite thing about it! 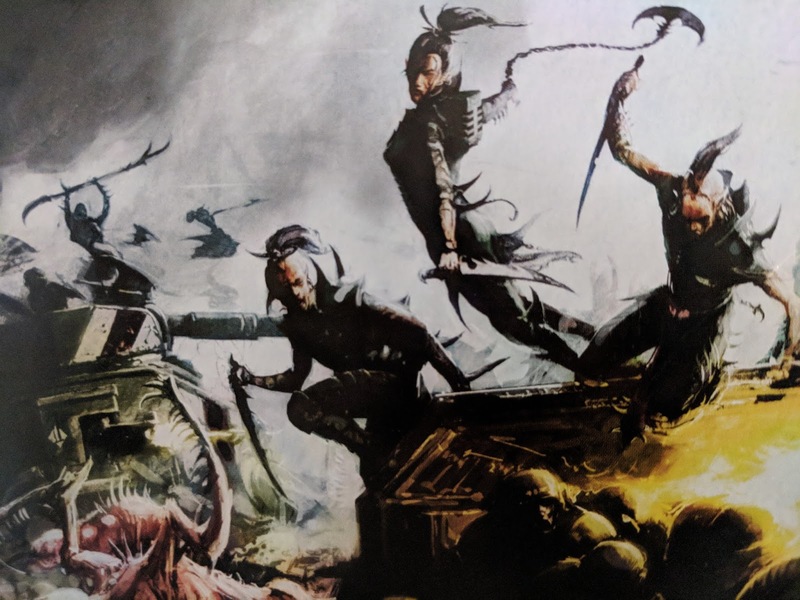 We're not just talking about a handful of viable builds here; each of the 3 Drukhari sub-factions (Kabal, Wych, & Coven) have within them several flavors of play each with their own Warlord Traits, Artefacts, Stratagems, and Obsessions. There's a LOT going on in the rules section of this book and from what I can tell, Games Workshop carefully and thoughtfully designed how all of these rules could interact -- the result is a mind-boggling number of ways to field Drukhari that feel unique, characterful, AND competitive from a gameplay perspective. It would seriously take a dedicated individual many many months of tweaking and toying with their list, then playtesting of course, to honestly try all of the various army builds and combos offered in this book. The replay-ability of this codex is through the roof and I haven't been this excited about an army since I first got into Dark Eldar in 5th edition! Apples to apples, the list now clocks in at 1679. That's 321 extra points to play around with, which in this book can buy you a lot more bodies! Almost everything came down in points but the big standouts are Raiders dropping 30pts, the Succubus dropping over 20pts (yet still a total beatstick! ), and really just all Drukhari wargear in general is super affordable. 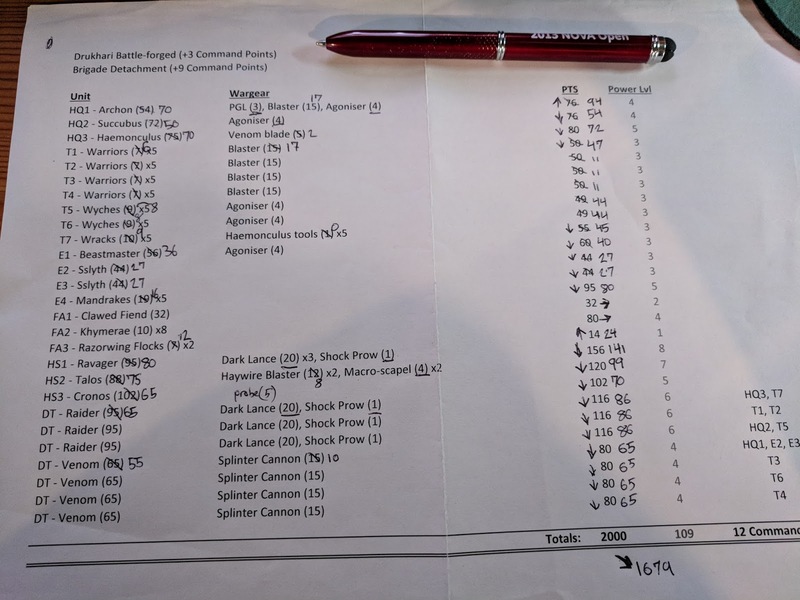 Army composition-wise, things got interesting in this codex. 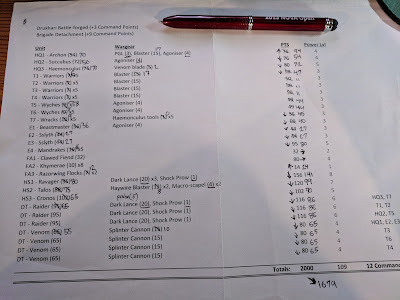 Despite the 'whine heard round the world' over the Raiding Force special rule (3+ Drukhari Patrol Detachments = +4 Command Points; 6+ Patrol's = +8 CPs) this is one area where things actually got a little worse or less flexible for Dark Eldar. I like the Raiding Force rule as it is fluffy, but the reaction to this was so overblown for the simple fact that there are better detachments for maximizing Command Points; i.e. Battalions which every army has access to. Also, most big tournaments impose a 3 detachment limit and most have already stated that they are not making any exceptions for Drukhari, which right or wrong is the TO's prerogative. What is even more limiting than that, and the change that invalidates my **Brigade list above, is now Beasts and Court of the Archon units no longer "take up slots in a Detachment"... they word this like it's a good thing, haha. What this really means is you have 3 less Fast Attack and 4 less Elite choices that can fulfill the requirements of other detachments, like the Brigade. It's not that big of a deal to me as we have much better options in both of those slots (Scourges & Mandrakes spring to mind) however you will need to use all of those extra points we gained in order to make the Brigade work. But yeah, like everyone else Battalion detachments are probably the way to go. 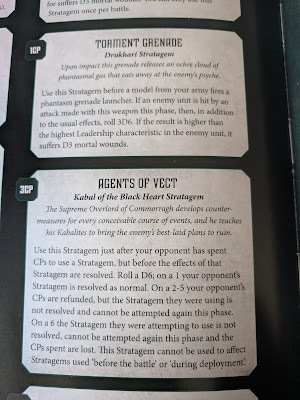 Agents of Vect, a unique stratagem available to Black Heart Kabals, is the bees knees! It's game changing, meta-busting, good, and feels so 'Dark Eldar' I love it. You don't even have to use it, just having it available has a psychological impact on your opponent. 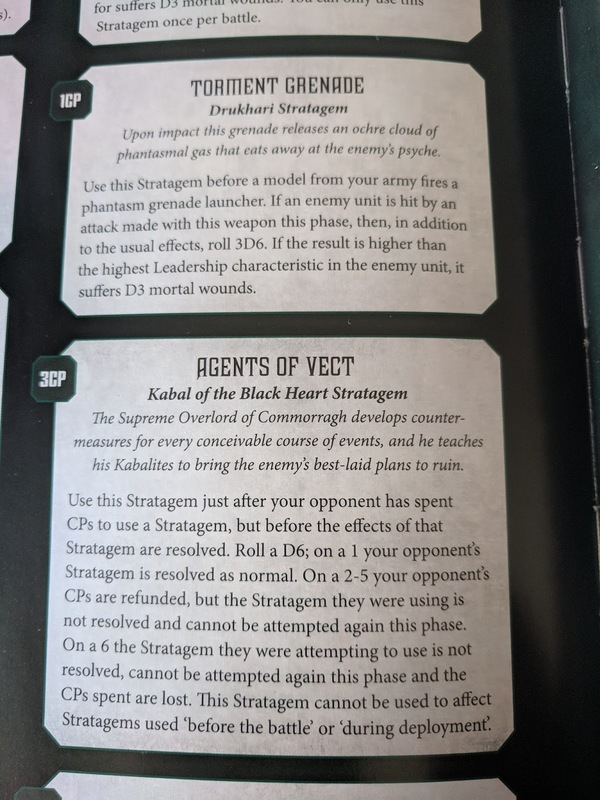 It's the kind of thing that makes Drukhari an army to be truly feared, and Vect one step closer to 'he who shall not be named' haha. It's so fitting and will certainly keep your games interesting! Now, if you don't play Drukhari and you're worried about facing it or whether or not it's OP... first, take a deep breath. 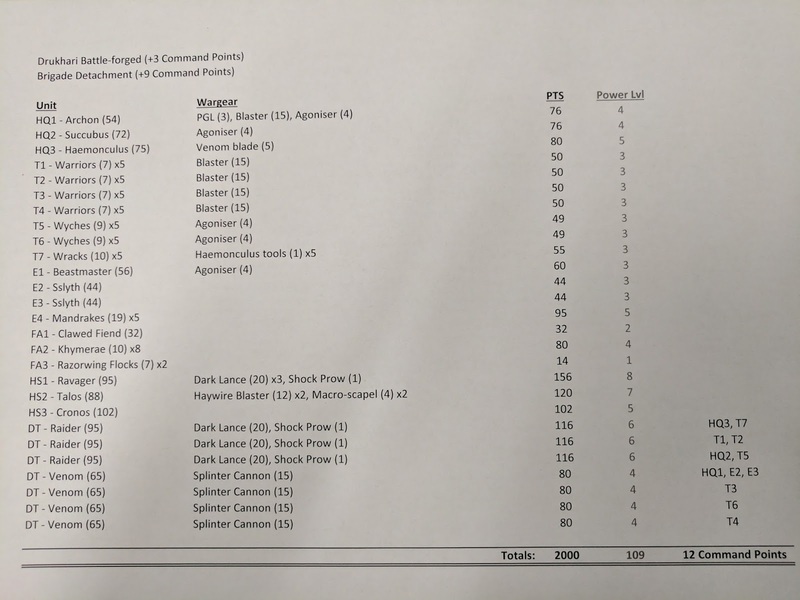 Then, consider everything I said in the first paragraph -- I don't think you are ever going to find any 2 Drukhari army lists at an event that are identical. There are seriously so many viable & fun builds, I'm blown away by the depth of options available in this codex. Sure, Black Heart stands out a bit in the Kabal section, no doubt. 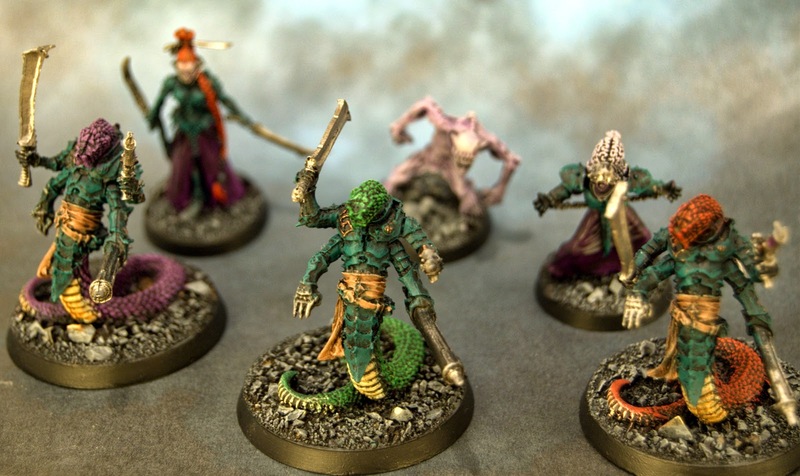 But have you seen the Wych Cult options?!?! Talk about tough choices! When you start to factor in all the combos you can stack on your wyches, reavers, hellions!, and of course the Succubus, things start to get really scary... And we haven't even started talking about Covens yet haha. Anyway, I'll stop here, but GW hit this codex out of the park on so many levels. What are your thoughts on the new Drukhari?